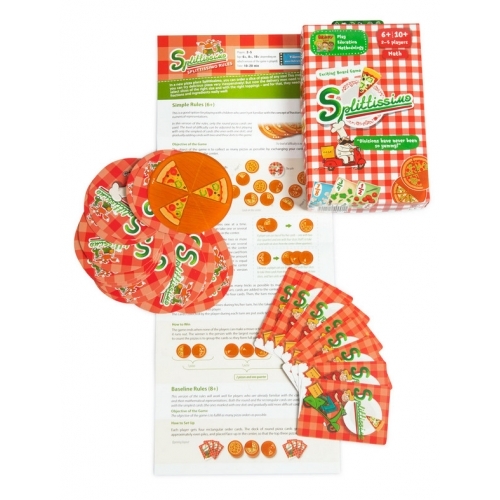 Signora ordered five eighths with tomatoes! 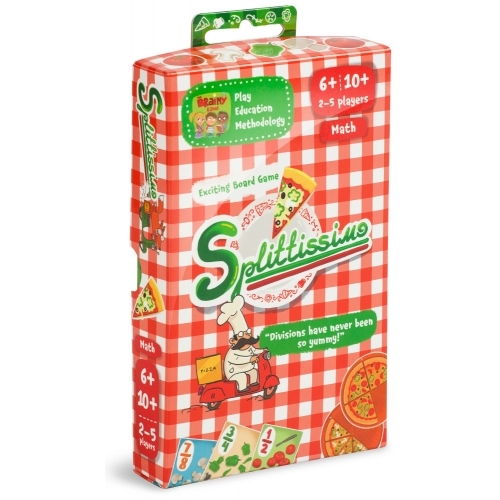 This game will make you sweat, as you’ll be working for the famous and respected Italian pizzeria called Splittissimo. 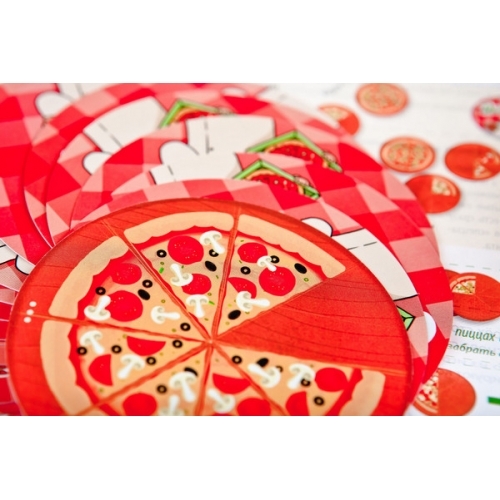 Its fussy clients love to order pizza by slices. By playing this game you'll become such an expert in fractions that you'll be second to none. 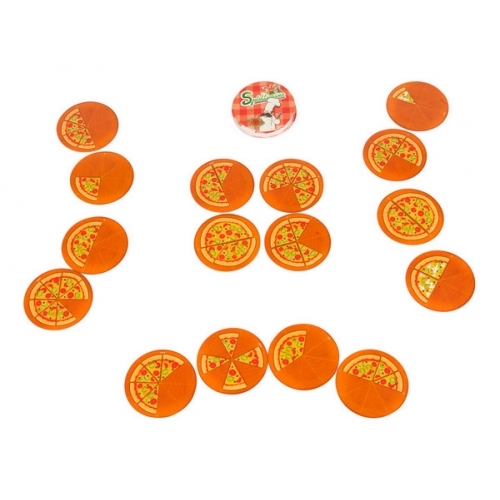 The game set is designed in a charming Italian style. It includes both rectangular cards with orders and fascinating round cards. The latter are trays with different numbers of pizza slices. Apart from cheese and olives, pizzas include tomatoes, mushrooms, and peppers in various combinations; each one can have two additional ingredients. Splittissimo offers the fastest delivery! There are several versions of the game. Let’s start with the easiest one. If you’re playing with children of five and older, use only round cards. Beginner level cards are marked with one dot (to make it more challenging, you can add cards with two or three dots later). 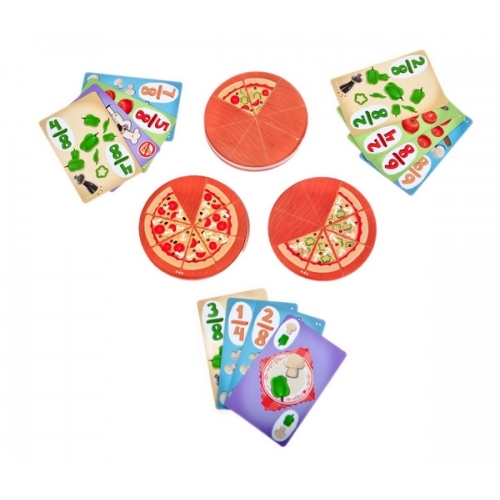 Each player takes three cards and puts them face-up in front of him; the same number of cards is placed face-up on the table (playing by the rules of a more challenging version, the players draw 4 cards and 4 cards are placed on the table) The task is to use several playing field cards to assemble a pizza , so that the number of its slices would be equal to the number of slices in one of your pizzas. 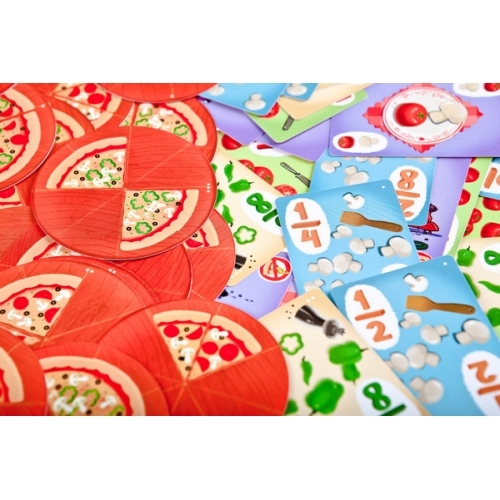 Or, conversely, you can choose one of the playing field pizzas and assemble it using several of your own cards. Playing with older kids, add the rectangular order cards. 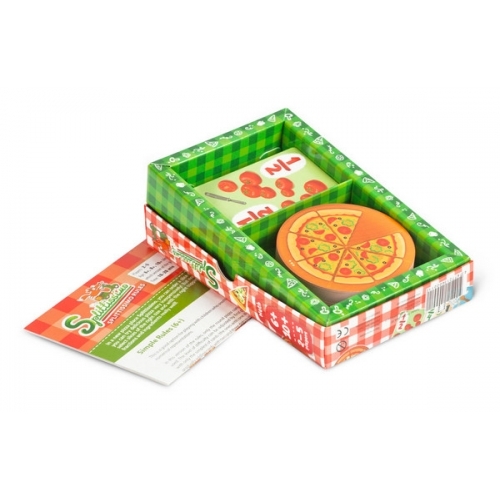 The task is to assemble the ordered pizzas using the cards on the playing field, taking into account both their size and the ingredients. To add excitement to the game, use a number of special cards, which allow you to slow down your opponents’ work and accelerate your own pace using “last minute” orders. All versions of the game end with counting the whole pizzas that players managed to put together. 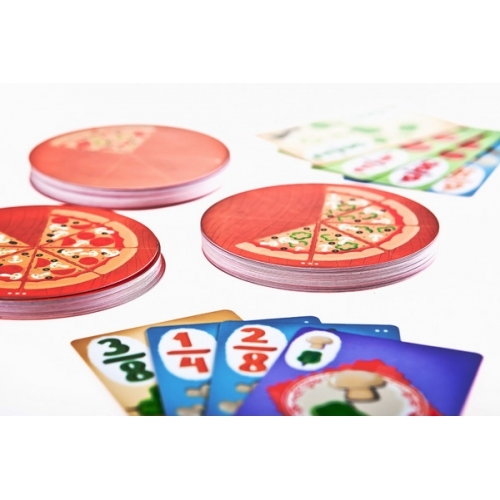 In other words, the players should make whole pizzas from the slices they have, which helps them to reinforce addition of fractions once again.